Remember, Ramadan fasting is not about eating healthy or dieting, after sundown most Muslims consume at least as much energy as on a non-fasting day. While scientists usually refer to alternate-day fasting as “intermittent fasting”, the average fitness enthusiasts will think of Martin Berkhan’s “lean gains” protocol, when he or she hears the words “intermittent fasting” – a protocol that involves fasting for minimally 16h and eating for maximally 8h and is thus somewhat similar to the “eat only after sundown” protocol Muslims follow during Ramadan. Against that background, it makes sense to assume that the two dozen of peer-reviewed Ramadan fasting studies from the Middle East and the Muslim part of Asia provide an (albeit often uncontrolled) model for intermittent fasting. Do you have to worry about fasting when your’re dieting!? If we assume that this premise is true, a recent study from the Dr. Cipto Mangunkusumo General Hospital at the Universitas Indonesia, provides intriguing insights into the lean mass conserving effects of “intermittent fasting”. The study aimed to evaluate the effect of Ramadan fasting on body composition in healthy Indonesian medical staff. To this ends, Ari Fahrial Syam et al. (2016) recorded the body composition of healthy medical staff members of the Dr. Cipto Mangunkusumo General Hospital before, during and after Ramadan fasting in 2013 (August to October). Figure 1: Changes in body composition during the 28-day Ramadan fast (Syam. 2016). In conjunction with data on the energy intake of the forty-three subjects, the data the scientists gathered appear to confirm what the proponents and followers of the “lean gains” variety of intermittent fasting say: You will lose body fat, but not muscle and that without significant reductions in energy intake. According to 24h food recalls, the subjects didn’t change their energy intake during Ramadan. The fat loss can thus not be explained by the induction of a caloric deficit. Yes, the body composition was assessed by BIA, but … while body impedance analysis (BIA) may not the best method to assess the %fa and % lean mas of trained athletes, but has been shown to have a high accuracy and reliability in “normal” people. Similarly, the 24-hour food recalls that were used to evaluate the subjects’ dietary intake are often a bit off, but that’s the case for both pre- and post-assessments, which is why it is reasonable to assume that there was indeed no significant change in total energy intake. This doesn’t change, though that it’s a pity that the scientists don’t provide information about individual nutrients intakes. Previous studies suggest increased protein intakes during Ramadan fasting (Frost. 1987; El Ati. 1995) – a potentially highly relevant increase, obviously. One thing Syam’s study adds to the table, however, is that (a) the weight you will lose is not just body fat, it’s also a lot of water and even bone (see Figure 1) and that (b) your (fat) weight will bounce back, within 4-5 weeks when you return to your usual eating habits. Table 1: Overview of pertinent research comparing the results of the study at hand to previous studies (Syam. 2016). As the research overview in Table 1 shows, some, but not all of the (side) effects are actual news. Hossini et al. (2013), for example, didn’t observe changes in mineral or water content. The initially highlighted lack of protein / muscle loss, on the other hand, was observed in all three studies in which the exact body composition was measured. It is thus not unreasonable to assume that this is a characteristic feature of pertinent “intermittent fasting” protocols. Bottom line: Don’t get all excited, even if the 24h food recall were accurate and the fat loss occurred in the absence of reductions in food intake, the fat loss was statistically significant, but with less than 500g practically negligible. El Ati, Jalila, C. H. I. R. A. Z. Beji, and J. A. B. E. R. Danguir. 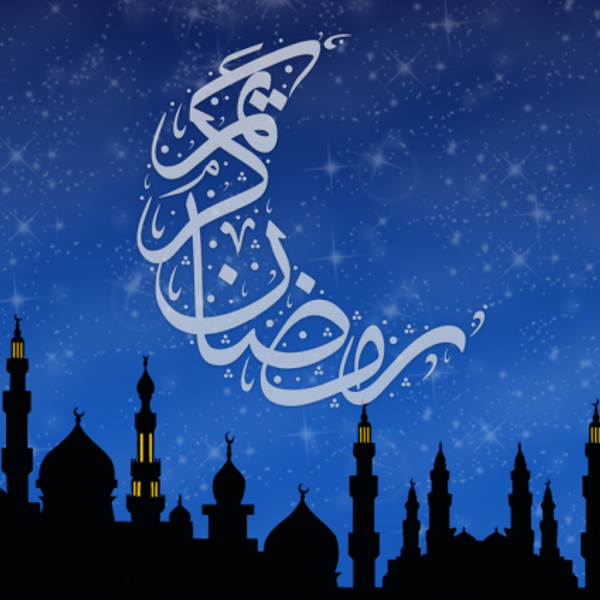 “Increased fat oxidation during Ramadan fasting in healthy women: an adaptative mechanism for body-weight maintenance.” The American journal of clinical nutrition 62.2 (1995): 302-307. Frost, G., and S. Pirani. “Meal frequency and nutritional intake during Ramadan: a pilot study.” Human nutrition. Applied nutrition 41.1 (1987): 47-50. Hosseini, Seyyed Reza Attarzadeh, et al. “The effect of ramadan fasting and physical activity on body composition, serum osmolarity levels and some parameters of electrolytes in females.” International Journal of Endocrinology and Metabolism 11.2 (2013): 88. Faris Mohammed Ahmed, et al. 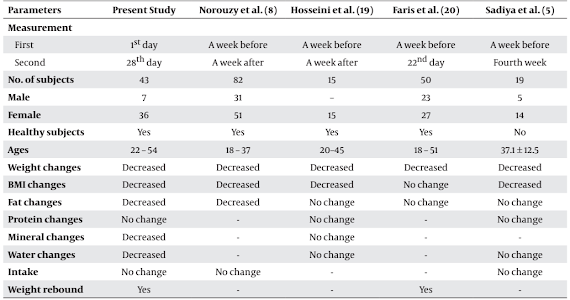 “Impact of Ramadan Intermittent Fasting on Oxidative Stress Measured by Urinary 15-F2t-Isoprostane.” Journal of Nutrition and Metabolism 2012 (2012). Norouzy, A., et al. “Effect of fasting In Ramadan on body composition and nutritional intake: a prospective study.” Journal of Human Nutrition and Dietetics 26.s1 (2013): 97-104. Sadiya, Amena, et al. “Effect of Ramadan fasting on metabolic markers, body composition, and dietary intake in Emiratis of Ajman (UAE) with metabolic syndrome.” Diabetes, metabolic syndrome and obesity: targets and therapy 4 (2011): 409. Syam, Ari Fahrial, et al. “Ramadan Fasting Decreases Body Fat but Not Protein Mass.” International Journal of Endocrinology and Metabolism 14.1 (2016).